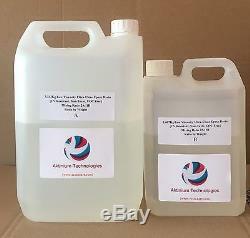 5kg Low Viscosity Ultra-Clear Epoxy resin [UV Resistant] (3.333kg A + 1.667kg B). Cures clear to a glass-like finish. Good flow, easy to work with. No yellowing, even if left outdoors under direct sunlight. A safe product to work with virtually odourless and no fumes. At 2mm thickness layers and above, the resin self-levels. Easy 2:1 Mix Ratio. Simply mix 2 parts A to 1 part B by weight. (garages, indoor, garden paths, penny floors). (kitchen tops, garden tables, bars, wooden tables). How much will I need for a surface area? A general rule is that 1kg of epoxy = 1m2 = 1mm thick layer. Minimum recommended thickness for floors, tables and surfaces is 2mm, to enable uniform and adequate coverage; so 2kg/m. 2kg Epoxy Resin per square metre = Minimum Coverage for floorings/tables/surfaces. Epoxy Resin and Colour Pigments. To achieve full colouration i. A solid colour throughout, you would need 4% in pigments of the weight of the epoxy resin used. So if you are using 1kg of resin, you would need 40g of pigments. All our kits come with a detailed, step-by-step instruction guide on how to use our epoxy resin and common pitfalls to avoid when working with our resin. Must follow the instructions closely to ensure proper results. There is no problem with doing several layers of resin to finish a project. As long as you wait for a particular layer to fully cure, you can do as many youd like. The result will be the same. We do not recommend a single layer that exceeds 10mm in thickness. This is because resin undergoes an exothermic reaction and can heat up quickly when it is too concentrated or in large volumes. 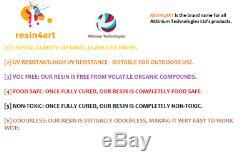 Epoxy resin undergoes a curing process, which is a chemical manifestation. It is not a drying time. The curing process of epoxy resin is directly related to the surrounding atmosphere temperature. Note: We do not recommend carrying a project with epoxy resin in cold temperatures. At 20C = 12-24 hours. At 25C = 6-9 hours. At 40C = 3 hours. At 60C = 1.5 hours. At 100C = 0.75 hours. You can place the mixture in an oven not exceeding temperatures of 100C to speed up the curing. All common pitfalls and mistakes are noted in our instructional manual which comes with every order, to help you get the perfect results from our epoxy resin. Here, we briefly highlight some of the commonest errors that can lead to non-curing of the resin and/or not getting a clear finish. In damp and humid conditions, moisture can seep into the resin while it is curing, which can lead to the cured resin looking cloudy or blotchy or having fractures. Keep the area dry and warm (turn the heating or a heating fan on), prior to starting the project and keep it on for the first few hours. Incorrect 2:1 Mixing Ratio. If the mixing ratio is inaccurate, the resin will not cure. Adding more Part B will not speed up the curing. Working with very small amounts (under 75g mixture) greatly increases the risk of error. When you pour the epoxy resin, whatever you are pouring it over or into must be completely dry and clean, and free of any waxing, oiling and spraying agents, as these can impede curing and clarity of the finished product. Shelf Life = 6 months from date of manufacture. Viscosity at 25 deg C.
The item "Low Viscosity Ultra-Clear Epoxy Resin UV Resistant 5kg Kit" is in sale since Wednesday, January 25, 2017. This item is in the category "Vehicle Parts & Accessories\Boats Parts & Accessories\Boats Parts & Maintenance". The seller is "aktiniumltd" and is located in Bushey. This item can be shipped worldwide.